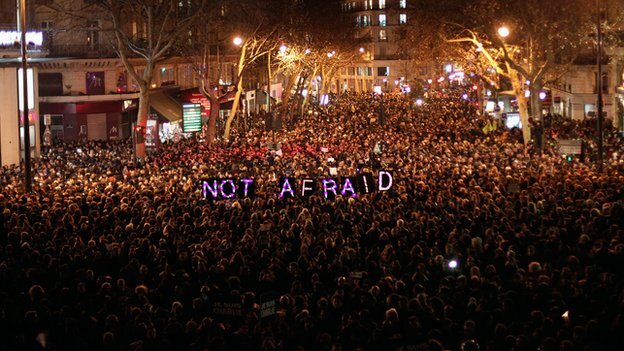 France has just lived through one of those days which will remain engraved in the national memory. The country has known terrorism before. There were waves of Middle East-related bombings in the 1970s, 80s, and 90s. There were the Islamist murders of Mohammed Merah three years ago. But never in half a century has there been a single attack of such cold-blooded ruthlessness. Never has there been a death toll like on the Rue Nicolas-Appert. A cartoonist is a photographer who changed his camera for a pencil. I have added above a quote and a link for those who do not normally follow European news. A.K. We do not need death to come like this. We do not need more painful sacrifices. We are beyond alters and killing our neighbors for differences in belief or sense of humor. Yes, it's sad that in the one country in Europe that recognized and promoted the Rights of Man, that the very beneficiaries bite the hands that recognized their essential humanity! 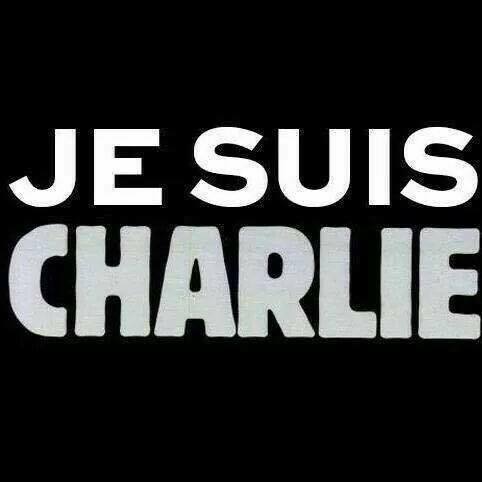 Our condolences to the families of those massacred and the entire French nation. I am ashamed of this tragedy! Instead of being intimidated by the massacre at the magazine office, the result has been the emboldenment of other political satirists. In France, it's not merely a case, as in the USA of "Freedom to worship or not", but rather freedom to express thoughts of ridicule for beliefs and extreme but hallowed behaviors. Read these 12 recent cartoons to get a sense of the outrage felt against freedom of expression. Also look at the video at the foot of the page. It explains the sense of the controversy very well. Essentially, do religions have the right to censor opinions about them? The magazine has poked at the Pope, Rabbis and Jihadists. I don't think there's any evidence that the publication has ever had intent to be bigoted or racist. but if Islam is the truth, then what on earth is the magical Pope doing in Rome, the Buddhists worshipping idols of theBuddha or Nepalese, worshiping a monkey god. Surely something is messed up in some of this thinking! I'd rather hold the view that religion is best viewed as a scaffolding, nor the actual building. We need to not be animals and behave in a civilized fashion valuing each other. The fundamental Rights of Man, developed in so many religions but forged, annealed and embodied in the French Assembly and it's imposition by the armies of Napoleon is written into the UN charter. As long as religion doesn't interfere with individual rights of freedom of thought and personal choices and expression, then, in all its forms, religion acts as scaffolding, culturally different of course, but all helping maintain a civil society. Right now, we have a claimed right of Jihadists and some states that criticism of religions shall be against the law, worldwide. So this is the divide we face. Nicolas, when I read about this, this morning. I was horrified. Humanity needs to learn more tolerance and compassion instead of fear tactics and terrorism. So sad! Unfortunately, those who live beyond the riches of a giant metropolis like Paris, can get starved of resources and become alienated. In the case of even 2cd 3rd generation Muslims from North Africa, they are still considered "foreign". Most are good citizens. Often they are religious but almost never hateful. However, poverty and prejudice makes some youth susceptible to hysterical voices of hate to the West. Sadly more than a few are going to be influenced by sermons carrying hate of the West, spread by Jihadists. Worse, if they actually go to fight in Iraq they become trained to kill.for their cause. They return to Europe as dangers to all the communities! This is happening, not just in France but in many places around the world. It's made worse by the strident drive for an Islamic Caliphate. Now, ISIS in Iraq has a 2 billion dollar budget. This is no longer a problem for individual communities facing "terrorist acts" by lone wolves. This is a serious and dedicated movement where the disaffected are imbued with a spirit of righteousness expressed in slaughter, self sacrifice and martyrdom. But I believe that the principles of civilizations greatest rational thinking*, support the Rights of Man. This supposes that each of us has inalienable worth and equality in every avenue of life. These rights now stand opposed to an evil culture that I believe is not representative of 21st Century Islam and the highest Islamic principles. *Those developed in the books of sages and discussed in Germany, England, France and elsewhere and fought for in the French Revolution then spread by the authority and might of Napoleon's Armies and finally embodied in the charter of the United Nations in the aftermath of the calamities of World War II. Let me add to this the following brief note on the Fench National character, again honed from the hard won values of the French Revolution and painful debates in the National Assembly and streets of Paris. During the Nazi occupation of France, 76% of France's Jews survived! How come? The surprising explanation is that enough ordinary French did not "out" Jews hiding in plain site in their villages or passing through to escape the Nazis. This, despite the natural personal antisemitic upbringing of some and distrust towards Jews held by more than a few. The latter, in any neighborhood or village, could have so easily doomed those Jews who moved into new locations with fake papers. The neighborhood's newcomers might have thought they were well hidden by their new names and papers. Actually it turns out, that likely as not, they were recognized. After the war, it turned out that all the time, folk in the village knew they were Jews and did nothing!! This factual tolerance is evidence of a French cultural deep respect for humanity, even if the aid was so passive as to not actually help rescue, feed or hide Jews. This widespread phenomenon, "the act of not reporting to the authorities", is a testament to the great lasting treasures the revolutionary debates of the street and Assembly gave to France as an inheritance. It did not solve all issues of ethnic bias, but did provide a moral backbone that's exemplary..................... and those who actually hid Jews were so brave, as they risked the execution of their entire family! So in France's current challenges, I know the essential backbone of values can ultimately prevail. 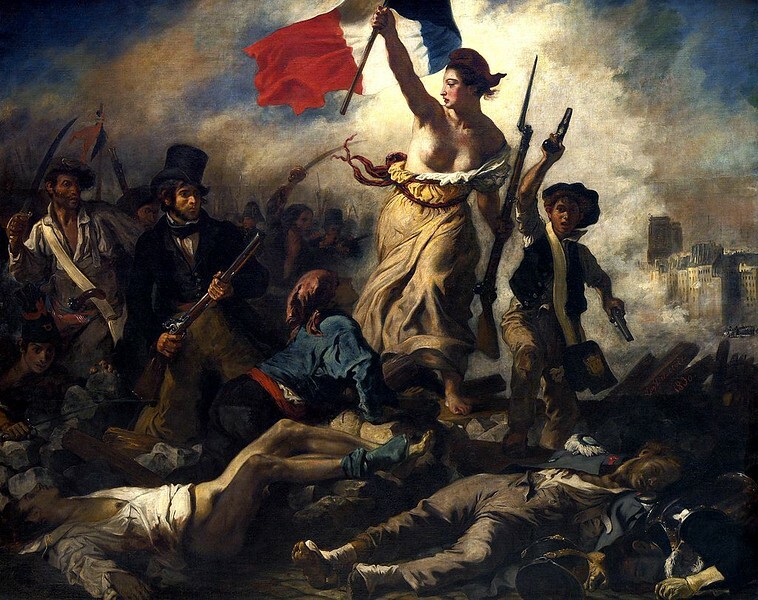 We do not need to be perfect, but we must be more than "good enough", in every generation to preserve Liberté, Egalité and Fraternité. Thank you, Nicolas and thank you France! "Je Suis Charlie!" …………………………..This is not just France in the court of judgement, but all the gains and values of Western Society in an existential fight with forces against blind savagery and delusion under the fanatical banner of faith.